Not to brag, but we’ve just discovered the latest addition to your dreamy music playlist. Sydney quintet E for Echo’s debut EP Dreamers is a refreshing serving of lush indie pop that will leave you feeling mesmerised and starry-eyed. Led by frontwomen Zana Rose and Jenna Murphy, their artistic influences range from Frida Kahlo and Ainslie Wills to The War on Drugs. This mixture of muses alone should give you enough insight into the eclectic vibes you can expect from the EP. But in case you were wondering, the final product is five-tracks of blissed-out indie pop driven by equal measures of fresh-sounds and nostalgia. The opening number ‘Tiny Fading Light’ ebbs and flows between other-worldly sounding synth and indie rock guitars. The EP then eases into ‘Let Your Hair Down’, an upbeat bop that inspires you to do exactly that. The dreamy-rock infused verses matched with a summery, vibrant chorus will have you pining for dance floors and warmer months. ‘Not Like You’ lures you in with soft and hypnotic harmonies, before building up with powerful guitar riffs and rattling percussion. Premiering on Music Feeds, the debut single ‘Stay’ is definitely a stand out on the record. With a piano riff that draws inspiration from 90s trance mingled with indie rock guitar, this mixed bag of sonic styles stays true to E for Echo’s rejection of easy to pigeonhole genres. The ambient closing title tune ‘Dreamers’ is a fitting bookend track that’ll resonate with fans of Alpine and Middle Kids. “Why you gotta be so mean?” they softly lament over delicate guitar and drums. Short but sweet, ‘Dreamers’ is a lavish introduction to E for Echo. Produced by Ross James (who has worked with fellow local legends Vera Blue, Thelma Plum, Daniel Johns and Nick Murphy), the EP is super polished without losing its authenticity. 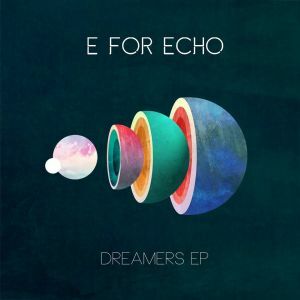 If you want to bless your ear drums with the rich sounds of ‘Dreamers’ in the flesh, you can catch E for Echo at their official EP launch at Petersham Bowls Club on 29 June. Listen to ‘Dreamers’ in full here.